JACKSONVILLE, Fla. (AP) — Calais Campbell has two things he wants to bring back from Arizona: An eighth victory and Larry Fitzgerald’s No. 11 jersey. “I get it’s a story line, but for me, you have to make it just another game and make it about just getting a ‘W,’” Campbell said Tuesday. “I have friends there. I spent a lot of time there. There’s a lot of history. But at the end of the day, you’ve got to live in the moment. No one should be surprised that Campbell wants to shift the spotlight. After all, the 6-foot-8, 300-pounder is a consummate pro and one of the reasons the Jaguars are atop the AFC South after 10 games since 2010. Campbell has NFL-leading and career-high 11 sacks, setting the tone for the league’s No. 1 defense , and has been a positive influence on fellow defensive ends Yannick Ngakoue (nine sacks) and Dante Fowler Jr. (6 sacks). His deep, raspy, voice provides a calming influence in the locker room and a distinctive sound in the huddle. “He’s had an enormous impact,” linebacker Paul Posluszny said. “He’s been able to change the culture of what things were to how it is right now. He’s had an absolutely enormous impact on that. Campbell had a similar effect in Arizona. He 373 tackles, 56 sacks, 42 pass breakups, 11 forced fumbles and three interceptions with the Cardinals, who chose to sign pass-rusher Chandler Jones to a long-term deal instead of trying to keep Campbell. 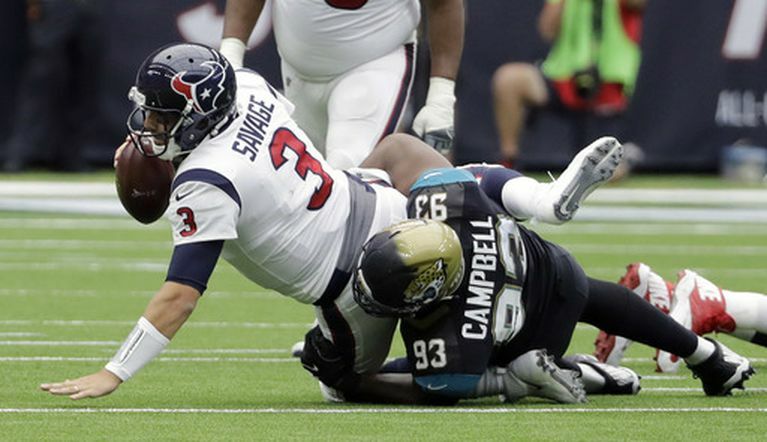 The Jaguars gave Campbell a four-year contract worth $60 million in March. The deal included $30 million guaranteed. Campbell saw Jacksonville’s potential to be a dominant defense and even referenced winning the Super Bowl long before he played a game for the floundering franchise. Eight months later, his prediction looks more possible than laughable. “I love the game of football and the ultimate goal is to win the Super Bowl and to get real close and not get there, it’s hard,” he said. “I thought I’d get back before now, but 10 years later I feel like this team we have has a real good opportunity. There’s one opportunity he doesn’t want to miss Sunday, and that’s getting Fitzgerald’s jersey.